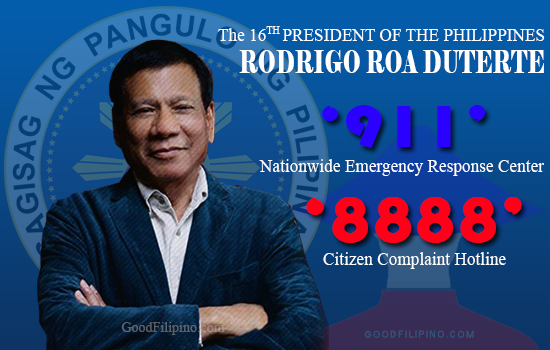 'Promise is promise,' as what the 16th president of the Philippines told during his campaign period, president Rodrigo Duterte is set to implement his '8888' citizen complaint hotline and '911' as emergency hotline. After this month of July, the citizen complaints and an emergency hotline will become available nationwide. Every Filipinos can now use the hotline numbers given by the Duterte's administration. In the interview of PCO secretary Martin Andanar by Inquirer, he said that in the month of August, the two new hotline numbers for Citizen Hotline 8888 and ang 911 Nationwide Emergency Response Center will be fully operational. In addition to that information, Andanar also told that the citizen complaints againts arrogant, freak behaviour, and bad attitude government officials can now be directed to the '8888' hotline number while for emergency. According to VOVph, "Pwede ring idulog sa nasabing phone number ang mga hindi naaaksiyunan na proyekto ng gobyerno pati na rin ang mga umaabuso sa kani-kanilang mga posisyon." "Nauna nang sinabi ni Pangulong Rodrigo Duterte na gagawin niyang 24-hour ang nasabing hotline na tatauhan ng mga opisyal ng Presidential Action Center (PACE) para mas maging mabilis ang pagtugon sa reklamo ng publiko," VOVph added. But there's a reminders for those who will try to bogus or make fun on the said hotline numbers. President Rodrigo Duterte will punish those people who try to do it, once the reported case was verified as fake or false. "Pero babala ni Duterte na dapat ay mga totoong reklamo lamang ang ipararating sa hotline dahil mananagot sa kanya ang sinumang gagawa lamang ng kwento para ididiin ang isang partikular na tauhan ng pamahalaan," as what VOVph posted. FYI, the current hotline number '117' will be replaced by a 911 number, which will link to the Nationwide Emergency Response Center. The number 911 is 24-hour service and would be manned by officials of the Presidential Action Center (PACE). What can say about this two new hotline numbers of the country? Please took the comment box below and share your thoughts. Comments or suggestions about "Duterte's nationwide complaint and emergency hotlines coming on August 2016" is important to us, you may share it by using the comment box below.